Where is the -- ? You gimme some real rock and -- What? Real rock and -- Whoop! All the synthesizers dancing in a chorus line -- What? And she still looks a lot like Marilyn -- Say what? In the late 70s and early 80s Robert J. McCafferty, a dropout from the University of Pennsylvania class of 1976, worked as a concierge at the luxurious Bellevue Hotel (a fact which would later have great lyrical significance) and hung out on the fringes of the South Street club scene, managing Kenn Kweder (as if anyone could manage Kenn Kweder). One day he woke up and wrote a song: "King of England." At the Haverford School, where he had gone before Penn, his nickname had been "Bobberoo." 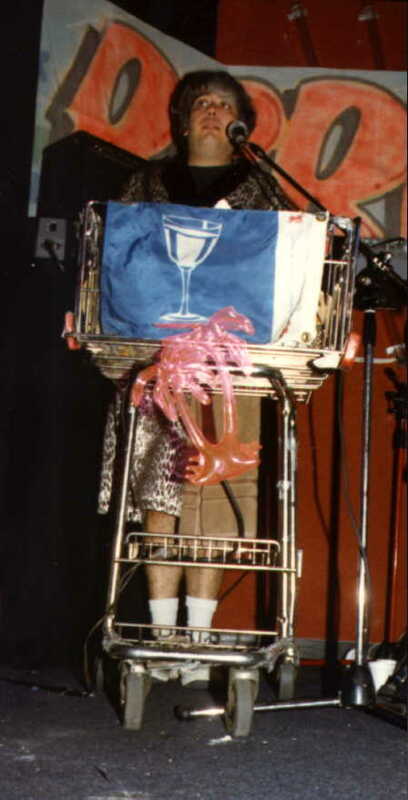 He twisted this around into his stage name, "Bob Beru," grabbed five of Philadelphia's best rock musicians, and started Beru Revue. Their first gig was September 6, 1981, at Grendel's Lair in Philadelphia. Tommy Pinto soon replaced the original drummer, Bob Wynn. 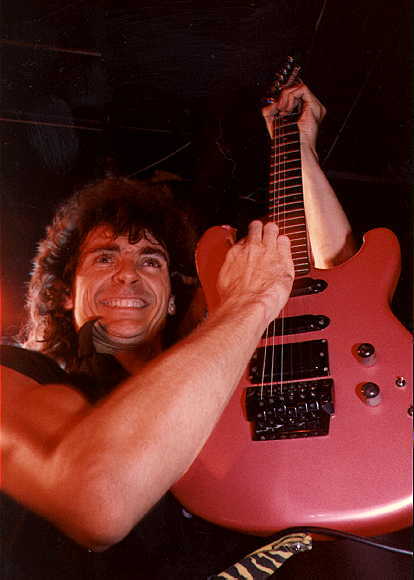 Berklee School of Music graduate Greg "T-Bone" Davis played virtuoso guitar. Former Secret Kids filled out the line-up: Buzz Barkley on keyboards, Johnny Sacks on bass, and Jerry Healy on guitar. Nick Norris managed the band. 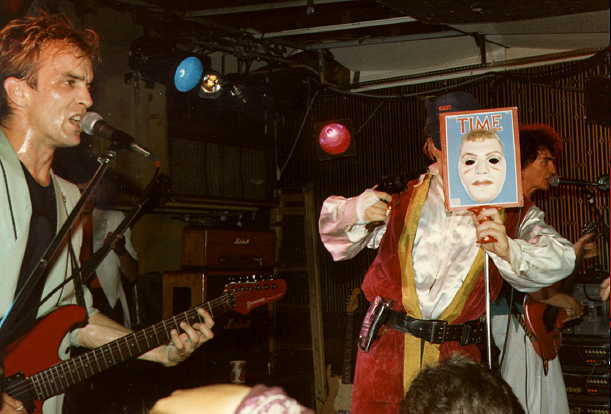 The first time I saw Beru Revue was on January 18, 1985, at Central Park in Wayne, Pennsylvania. I arrived at the club just seconds before the band went on stage. I had no previous knowledge of what they might be like, except for a few of their songs I had heard on the radio, but which had made little impression on me one way or the other. The fact that I did not know what to expect was probably the best preparation I could have had for what was to follow. The immediate effect they had on me as they appeared and did their first number was overwhelming. I felt as if a longstanding void in my life had been filled. Before the first song was even over, I knew that this was my band, the band that addressed my particular recreational needs. I had not felt this strongly on the side of a band in many years. As I listened to "Bwaah," their finale that night, I felt an extraordinary sense of being fully at home with the experience, just as I had felt when I first heard the Beatles' "She Loves You" in 1964, the Rolling Stones' "Satisfaction" in 1965, the Byrds "5D" in 1966, the Who's "I Can See For Miles" in 1967, Jefferson Airplane's "The Ballad of You and Me and Pooneil" in 1968, Led Zeppelin's "Babe I'm Gonna Leave You" in 1969, the Grateful Dead's "Box of Rain" in 1970, Jethro Tull's "Wind Up" in 1971, David Bowie's The Rise and Fall of Ziggy Stardust and the Spiders from Mars in 1972, Mott the Hoople's "Violence" in 1973, Eric Clapton's "Let it Grow," in 1974, or the Kinks' "Education" in 1975. In fact, no music had generated in me a positive feeling of such intensity at least since the Police's "So Lonely" in 1978. This Beimichsein, as the Germans might call it, was total and unqualified. I felt that living in Philadelphia in 1985 was culturally comparable to living in Liverpool in 1963, Los Angeles in 1965, or San Francisco in 1967, in the midst of such exciting yet embryonic rock music environments. Beru Revue's bassist, drummer, keyboardist, and two guitarists took stage just I came within sight of it. They were evidently among the best skilled rock musicians in Philadelphia at the time, which is quite an honor in that part of the world. I liked the riffs they were playing as intro, but when the sixth member, the singer, entered a few moments later I was instantly astounded. The first time I saw Bob Beru he was wearing faded pink high-top sneakers, bright pink sweatsocks, peach jodhpurs, a pink satin cummerbund, a light pink ruffled shirt, a somewhat darker pink bow tie, a deep pink roundabout jacket with braid and epaulets, light pink cloth gloves, ruby red sunglasses, full facial make-up: clown white with exaggerated red and yellow highlights and a big red rectangle under each eye and a battered old American army helmet over his shoulder-length straight blond hair. The strobe lights were flashing and he was dancing like a big, muscular acrobat, picking up all his cues with timing that Jack Benny would have envied, and twirling a nightstick dangerously close to the noses of front-row onlookers. He had the best self-confidence on stage of any performer I have ever seen, before or since. He may have been only a local celebrity, but he was certainly a past master of his craft. I remember wondering how much longer Philadelphia would be able to enjoy him before he became a national star. That he never achieved wider fame was certainly not the fault of his performance. The drummer was dressed in a torn muscle tee shirt, and with his short, slicked-back brown hair, he looked like the typical greasy South Philadelphia street punk. 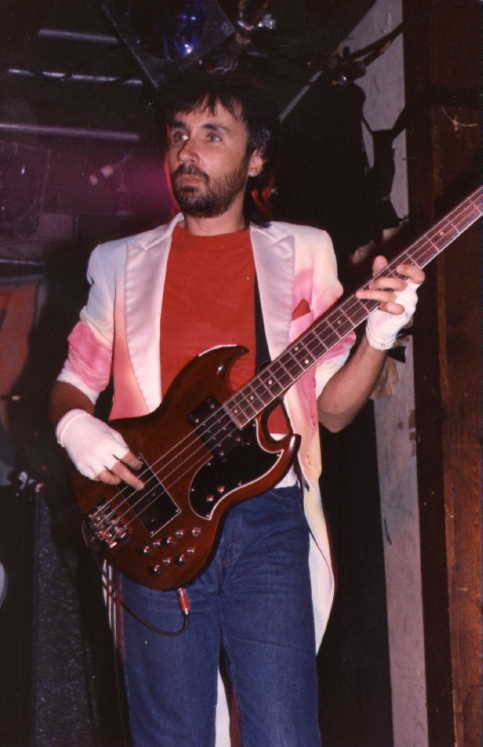 The raven-haired bass player wore regulation army issue camouflage pants and boots, but above the waist he was strictly formal, with black tie and tails, red cummerbund, and black lace half-gloves. The keyboardist wore a knee-length fur lined silk bathrobe, with fur slippers and bare legs. His steel-gray hair seemed from the front to be cut conventionally, but the tail in back reached his waist. 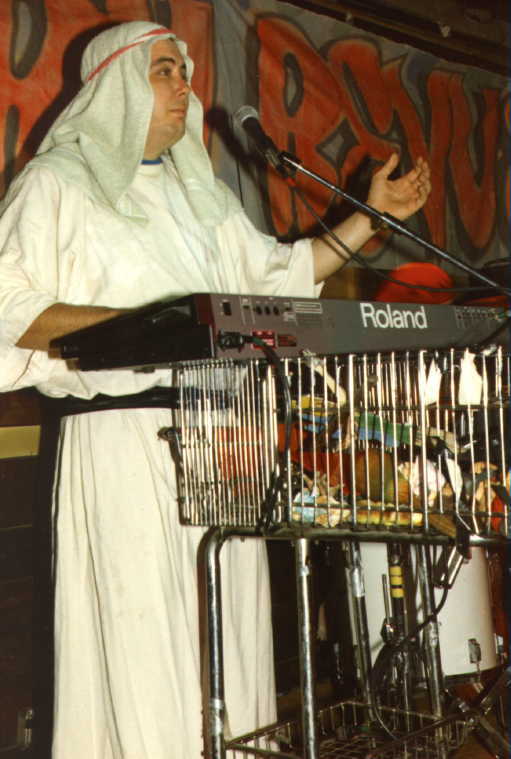 His electric piano rested across the top of a real shopping cart filled with toys, wigs, gizmos, spare parts, kindergarten rhythm instruments, garish bric-a-brac, and God-knows-what-else. The two guitarists were dressed alike, all in yellow, with black graffiti covering their shirts. 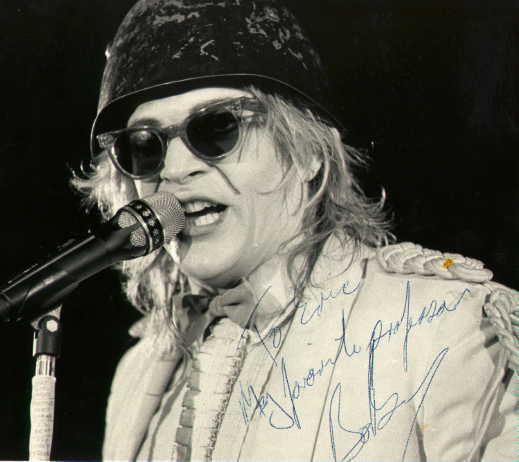 Bob would change his clothes with every song, his costume always somehow appropriate to the message of the lyrics. The lighting was errorless. Two weeks later, I arranged to host one of their gigs, met them backstage, and soon became friends with all of them. I saw them in concert 56 times in the next eight months, and if I had not moved out of the Philadelphia area, I would have been to hundreds of their gigs before they disbanded in September 1988. As it was, I still made it to 92. 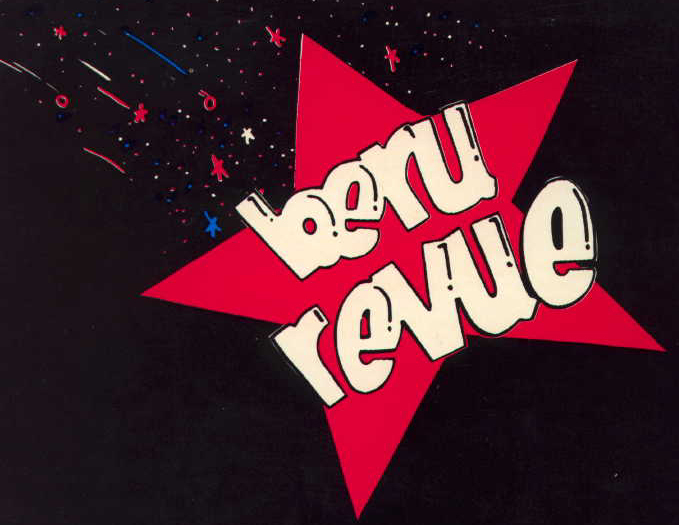 Beru Revue was the epitome of a comprehensive multimedia presentation, a smooth blend of not only instrumental virtuosity and refreshing lyrics, but also dance, costuming, props, theatre, comedy, plastic art, and above all, surprise. No two shows were ever the same, and no one knew what Bob would do, say, or use next. But on stage he always remained in control of himself and his audience. Ironically, the multimedial nature of their show, which had been the main reason for their original success, was also the reason for their failure. Steve Mountain, their manager after March 1985, seems never to have understood their uniqueness. He enforced the gradual separation of Beru Revue's music from its theatrics, and at last, in order to force them to concentrate more single-mindedly on the music itself in preparation for a recording career, forbade them the use of props and costumes on stage. But this decision was the death blow for the group. Bob is not a singer of wide range; and without the added visual elements of the show to compensate for his lack of strictly vocal prowess, the shows often failed to ignite the old spark. The new managerial fiats seemed to sap the strength from the rest of the band as well. They no longer played with the same fervor. They seemed not to enjoy themselves on stage as much as they had previously. Internal dissension grew. Two members left. An attempt to replace one of them and another attempt to continue with only four both failed to recapture their former esprit de corps. So, after seven brave years, they stalemated and dissolved. The point of all this is not that Beru Revue's music itself was enhanced by their stage show. Indeed, it was not, and could not have been, enhanced by these means. Rather, the actual performing of the music was facilitated by the whole show, as if the individual songs could not have been abstracted from their greater milieu without either cheapening or damaging them in some way. 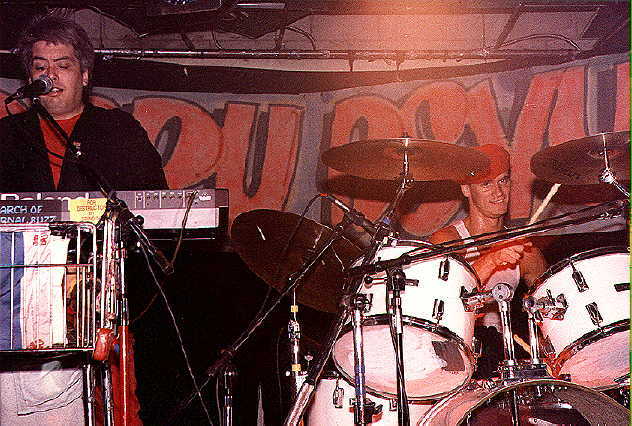 In other words, the energy and excitement of being live on stage, coupled with the planned vivacity of the show itself, enabled the band to play the same songs better, i.e., with a higher level of authentic feeling than they could have played them either in the recording studio or at rehearsal; and the audience felt this difference immediately. The difference was of the same kind as that in the film Butch Cassidy and the Sundance Kid between the results of Sundance's marksmanship when he had to stand still and those of when he was allowed to move his entire body as he shot. Beru Revue's songs were not materially different in concert, but their presentation was more fully energized, as thus also was proportionally the response of the audience. A key indication that this interpretation is accurate is that Beru Revue's original effect on most of us eventual Beruvians when we were familiar with only their sound was either negative or neutral; but as soon as we had become exposed to their entire show, their effect on us was momentous. In my own case, before I saw them in concert, their music had meant little to me, but afterwards, whenever I heard a Beru Revue song outside a concert setting, it would recall to mind memories of their live performances. It was, after all, their whole stage show � costumes, theatrics, dancing, rapport with the audience, satirical content, etc., as well as music � which constituted their appeal; and their music served only as the cement which held the show together, or made it coherent and memorable for the audience. Without the music, the show would not have been worth the time it took to watch it; but with it, the show took on the aspect of an integrated, perhaps even consummate, unit of entertainment. That is to say, music was the ultimate source of Beru Revue's power. Where are your sons today? Don't You Love the Poor? Funk -- Buzz Barkley! One! Two! Three! Four! Say, who's your neighbor? Is he black or she white? Things aren't always as they seem, are they? TIDBIT: Johnny Sacks's favorite Beru Revue gig was opening for the Hooters at the United States Military Academy, West Point. The Angry Young Judges were a mean, snarling, heathen, drunken group of boors who always travelled with Beru Revue. As a matter of fact, under their robes, shades, and fright wigs, they were Beru Revue. The Judges would play one set per gig, sometimes as the opening act, sometimes during the break, sometimes as the encore, sometimes when they were least expected. 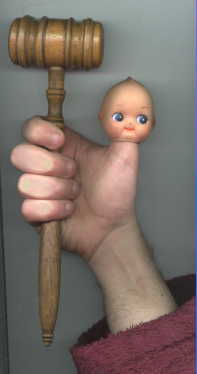 Bob would use his gavel to threaten the audience, to bang the baby doll's head he wore on his thumb, or to proclaim his manhood. The rest of the Judges sneered and grimaced and shook their fists and stuck out their tongues like Gene Simmons. The smoke machines, bubble machines, and strobes cranked out their stuff. Once every so many gigs, Bob would select a special someone from the audience, rush him/her backstage, shove a robe onto his/her body, a wig onto his/her head, a beer into his/her hand, and drag him/her onstage to sing "Get Me High" with the Judges. That was the official initiation as an Honorary Angry Young Judge, the most coveted recognition a Beruvian could receive from the band. Be careful tonight. Tonight is the night. Patriotic alcoholics, we built the schools! Isn't that what Engels meant, not so long ago? Is anybody out there, waitin' for me? This site is maintained by Eric v.d. Luft on behalf of Beruvians everywhere. If there is anything you would like to see here, please e-mail me at <ericvdluft@verizon.net>. Also, you can join the Beru Revue discussion group on Yahoo just by using the little form below. Does anyone remember the Reverend Rochelle the Rocker, Chaplain to the Stars?